Texas Housewife: What A Zoo! This is where we spent the day at today! The kids had no idea we were going until we drove into the parking lot. I suppose they thought we were just dragging them on a boring, out of town shopping trip or something. Ashley had never been to a zoo, so this was especially awesome for her! A great time was had by all, but now I'm a tired mama. I'll post pics and all about the fun we had tomorrow. Thanks to Lenore for being on pet duty while we were gone. I hope all the babies behaved for you. Wish I could have gone. That is my favorite Zoo ever. Maybe I can sometime on my own. Glad you enjoyed it. Pets were fine and happy to have some free time. Hope you like the garden that DH tilled up. Is it big enough for y'all? BTW Morgan won a crown, trophy and sash for most ticket sales. And Amy came in second runner up in her catagory. 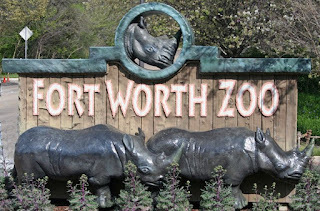 I love the Ft Worth Zoo...it is the best one in Texas (and I have been to about five of them). I am glad you got to have a fun day with the kids.